Looking back at my four years of college, there’s one thing I wished I had started earlier. Blogging. Not the Tumblr style blogging, full of memes and animated gifs, but writing interesting articles that challenged me to become a better writer and thinker. I remember the first time I setup a blog – I had no idea what I was doing (even though I was into web design at that point) – there were many things I had to learn. If you are interested in blogging in topics related to your major/career, I’m giving away everything I know about getting started. This includes setting up a WordPress blog, and creating your own web presence. There’s many pitfalls, but in this post, I want to get you setup with minimal time and effort. Why? Because many of you don’t want to learn the technical stuff, but instead want to start writing. Let’s go. WordPress is a content management system – it’s something that allows you to write pages and blog posts with ease. There’s a little learning curve, but you can do it, after all, you’re the generation that puts up with Facebook changing every few months. There’s a massive difference between WordPress.com and WordPress.org. With WordPress.com, you can get started for free, but you have to setup your blog and it looks like this (yourname.wordpress.com). That is not cool – you really don’t own your content. We don’t want that. Instead, use WordPress.org – it has a similar interface, but there’s some key benefits. The biggest benefit is that you are driving traffic to your site, not WordPress.com. There are two pieces to get WordPress.org setup. You must purchase a domain name (yourname.com) – try to use .com if available, but .net .org and .me are decent options. You must also purchase hosting space. This is where the website files are stored. This sounds scary, but it’s not. The key is to purchase your domain name AND hosting from the same provider, this will save time, and you won’t have to figure out a lot of crazy technical stuff. I like Namecheap – they even give you an article to get WordPress setup after you purchase your domain and hosting. My blog is setup, but why does it look so ugly? That’s because you are probably using a starter theme. A theme is some files that control how the website looks, and you can change the look and feel of your blog a couple ways. Free is the perfect price for broke college kids, and you can check out a ton of WordPress themes here. The only problem is that many of them are not very beautiful looking, so you’re not getting very far ahead. Use Themeforest to purchase a theme. They typically cost about $50 dollars, but the quality is much better. Especially this author – his themes are top-notch, easy to implement, and there’s even instructions on how to get setup. If you don’t have the money, stop partying for a couple weeks. Problem solved. Hopefully at this point, you’ve installed a nice theme, and you’re ready to create your first blog post. WAIT. When logged in, go to settings -> permalinks. Check ‘post name’ in the screenshot below and save. 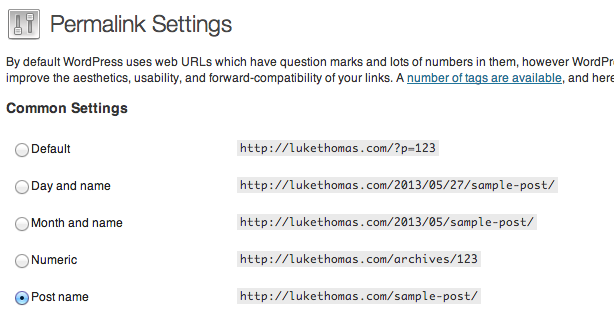 This may not make much sense, but this makes your blog posts easier to find in search engines. It lets Google know what your article is about. That’s pretty important, because when writing blog posts, you aim to gain new readers (some of them might be your future employers). If you are looking to rank REALLY well in search engine results, you need to use the WordPress SEO plugin. This plugin is like adding rocket fuel to your moped. It adds extra performance to your blog, and I highly suggest experimenting with other plugins as well. To learn how to add a plugin, learn here. Last but not least, you should be tracking your traffic in Google analytics. I use this plugin, and it has a super-simple setup process.